Celestial Eccentricity by Deb Breton. Measures 24 x 36 x .75 on stretched canvas. Celestial Eccentricity painting in living room area. Inspired by orbital eccentricity, though these lines would absolutely be more elliptical. In fact, this looks more like it could be Pluto’s orbit, with a stray asteroid passing through! 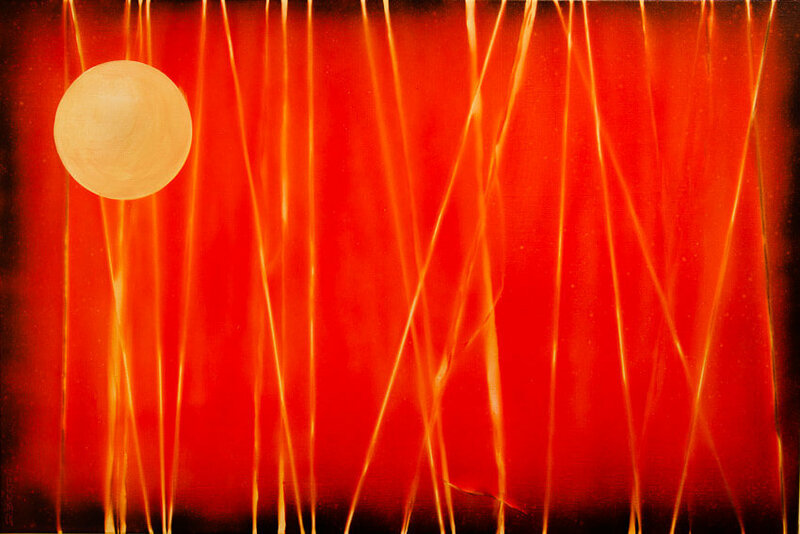 Abstract geometric painting with fine iridescent gold orb and lines. I like this, Deb, and your previous one, where the lines have lost and found edges. If you took the orb away you’re moving into Clyfford Still/ Barnett Newman country. I’d go bigger and explore the lines more. Nice. Hi Graham. Well thank you! I had to ‘google’ both of them. You’re right, without the orb, I see a similarity to Barnett Newman as well. I do have a larger canvas primed and ready to go, who knows?! I really appreciate your encouragement Graham, thank you.